Why are there so many webcams on the net, when most of them lack any serious function such as security or traffic monitoring? In fact webcams just show the real life, which is not very exiting most of the time. But as we all know this, those streamed pictures are more drawn from life to us, than any event on which e.g. a broadcast is focussed. 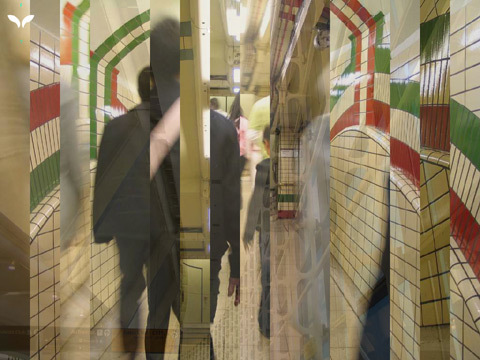 Webcams open the most direct tunnel to a foreign reality. 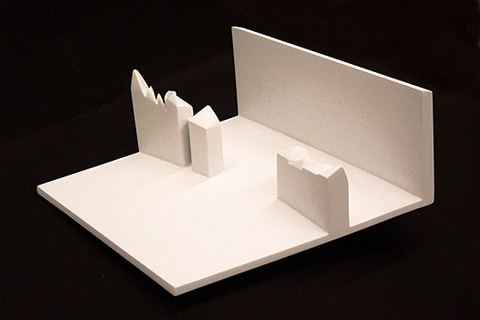 “Roermond-Ecke-Schönhauser” completes this idea by transforming this distant reality from virtuality to something real, touchable. 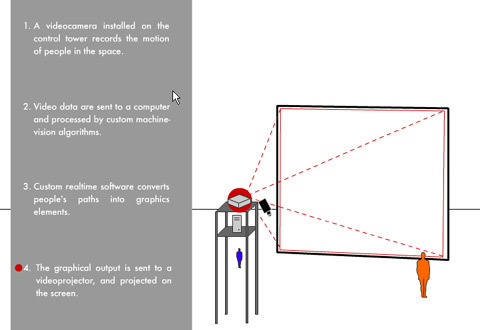 Therefore four elected webcam-streams (Denmark, crossing | Amsterdam, laundromat | Berlin, courtyard | Holland, marketplace) are projected with the help of a mirror construction on four models of the particular places. 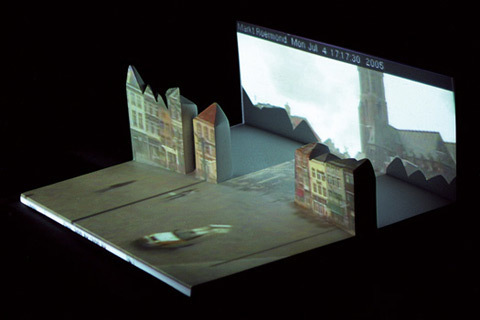 To make the projection fi t on the models, the architecture of the webcam-places was rebuild in a 3D-application and printed on a 3D-plotter, matching for the optics of the projector, which are different from those of the webcams. That way, the picture information is displayed on distorted geometrical shapes, similar to which it is filmed from. The result are four “live-models” of a distant space, which can be regarded threedimensional and are touchable. 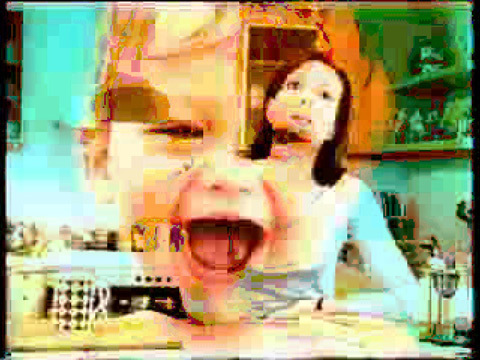 With this material manifestation, the transmission, in contrast to the usual webcam, where it remains virtual, is completed. The viewer adepts the webcam-stream as “real”. 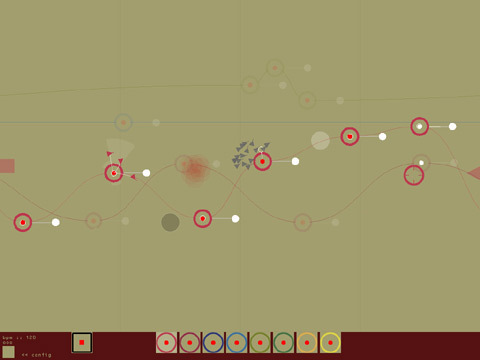 loopArena is a generative music interface for live – performance of loopbased computer music on a touchscreen. the user is able to control eight MIDI-Instruments such as sythesizers or samplers (soft- and hardware) and a drumcomputer in a playful way. Every element of the interface is an agent, which means it is enabled to act autonomously. The agents are programmed to generatively alter the music loop, help the user create harmonic melodies and at the same time to inspire the user and animate him to interact with the agents. Can a wall perceive what is going on all around? Can it keep a memory? Can it respond somehow? F[OL]LOW machine 1.2 will make the wall “intelligent” – a visual memory of collective processes – by endowing it with a machine-vision apparatus. 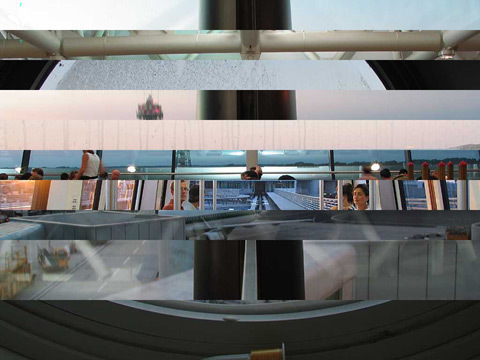 F[OL]LOW machine 1.2 is an interactive installation, which tries to represent the way people flow through the public site – the square, the metro stop, the parking lot, the waiting room – and opens up to a playful and aesthetic experience of the public surface – the wall. It visualizes thin chromatic traces on the wall, which are generated in real time, to reproduce the paths people follow when passing in the public site. F[OL]LOW machine is the name of a project for a Creative Ambient module, rather than for a single interactive installation. MIDIPoet is a software tool for manipulating images and text in real time. 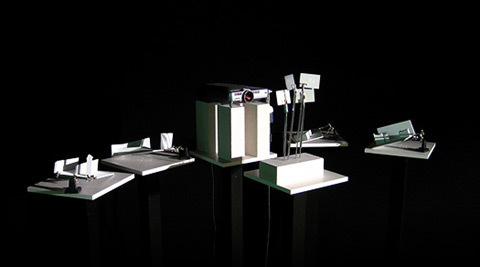 It uses its own visual language to allow users to create their own pieces, which can react to either computer keyboards and/or MIDI inputs. The first version of MIDIPoet was developed in 1999, a time where software for VJs was not very common. Since then MIDIPoet has stood its ground, and has been used in many different situations: poetry festivals, VJ sessions, interactive installations, classrooms. Its most recent version is available for free, at http://www.motorhueso.net. The web includes also a complete documentation, examples and tutorials. MIDIPoet’s approach to real-time image and text manipulation is simple, yet powerful. It has an easy-to-grasp programming language that lets you create quite complex pieces. 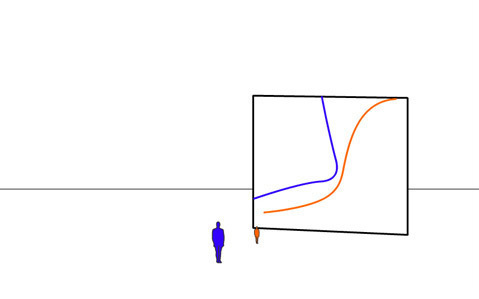 The language is based on the creation of “cause and effect trees”, where a specific input or internal condition has to be met in order for a connected event to happen. 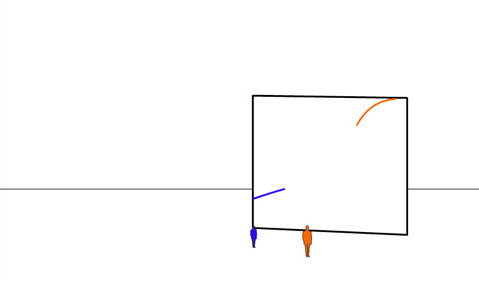 A MIDIPoet piece is formed by a set of trees, or “forest”. By using MIDI, MIDIPoet connects directly with many devices and applications. It has been used with musical instruments, sensors, and other weird devices. Flappable is a prototype for an online visual tool. Its build in flash, is dynamic and to a high degree customisable. It loads external swf files that can be changed, addet to etc. 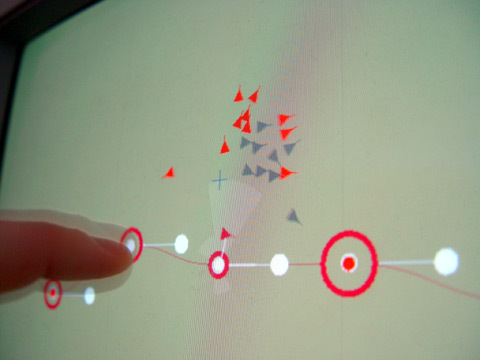 Flappable is ‘played’ (controlled) via keyboard input, some features react to mousemovement as well. Flappable picks up external sound volume via microphone and can react accordingly. Video-dnevnik is when time gives away a fingerprint. and west by building an interface in first Russian and English. This will maximise the communicative aspect of the project and give a broad audience in both east and west an option to break down the stereotypes distributed by main stream media. Video-dnevnik is using new media production and distribution means to reach beyond new and old walls and boundaries. Video-diaries is not a new method as such. Public service television and documentary film-makers has been using video-diaries since digital video started for more then ten years ago. The new aspect of video-dnevnik is to create a multilingual interface that is media specific and not a way of broadcasting television on Internet. That is why the project has chosen the Interactive Institute as an environment to develop the video-dnevnik interface. 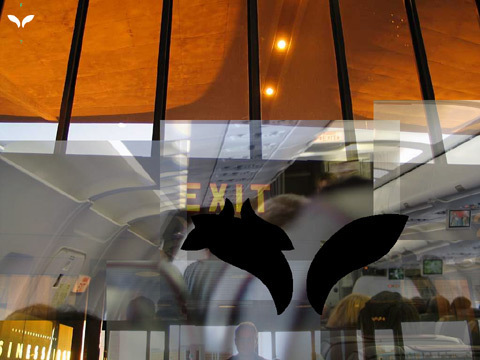 The Interactive Institute is a research and production facility based in Stockholm Sweden. 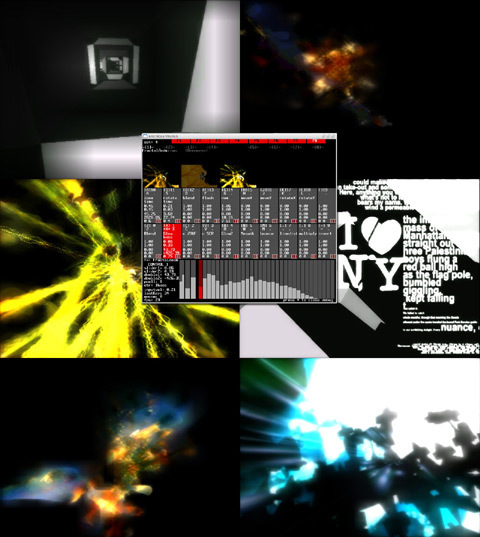 Eastböle is a VJ tool with realtime 3D engine, music synchronization and video capturing/mixing.